, son to sir Thomas Edmondes, mentioned as the patron of the preceding sir Thomas, was born in Shropshire in 1566 and in 1585 became either clerk or chorister of All Souls’ college took one degree in arts, and then was chosen fellow of the house in 1590. Four years after, he proceeded in that faculty; and then leaving the college, was, mostly by his father’s endeavours, made successively secretary, as it is said, for the French tongue to queen Elizabeth about 1601, remembrancer of the city of London, master of the requests, muster-master at Briel, in Zealand, one of the clerks of the council, and in 1617, a knight. 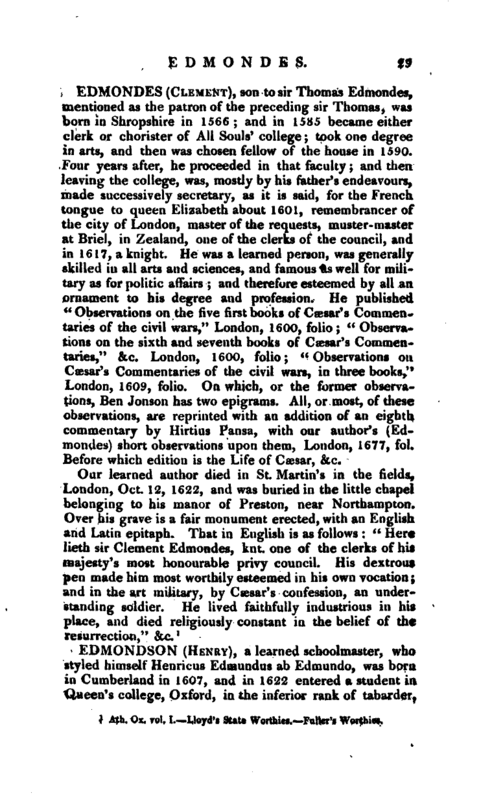 He was a learned person, was generally skilled in all arts and sciences, and famous as well for military as for politic affairs; and therefore esteemed by all an ornament to his degree and profession. He published “Observations on the five first books of Caesar’s Commentaries of the civil wars,” London, 1600, folio; “Observations on the sixth and seventh books of Caesar’s Commentaries,” &c. London, 1600, folio; “Observations on Caesar’s Commentaries of the civil wars, in three books,” London, 1609, folio. On which, or the former observations, Ben Jonson has two epigrams. All, or most, of these observations, are reprinted with an addition of an eighth commentary by Hirtius Pansa, with our author’s (Edmondes) short observations upon them, London, 1677, fol. Before which edition is the Life of Caesar, &c.
1 Ath. Ox. vol. I Lloyd’s State Worthies. Fuller’s Worthies.